Dedication: Robert W. Allard, Population Geneticist and Agronomist(M. Clegg). Bacillus Thuringiensis and Its Use as a Biological Insecticide (A.Aronson). Development of Virus Resistant Plants via Engineering (R.Grumet). 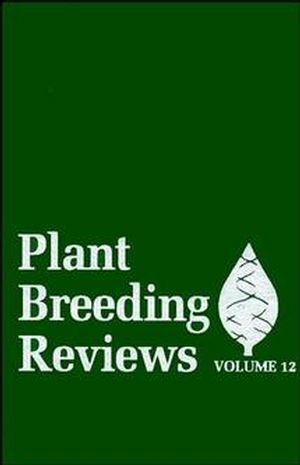 Carbon Isotope Discrimination and Plant Breeding (A. Hall, etal.). In Vitro Adaptation for Drought and Cold Hardiness in Wheat (G.Galiba). The Ideotype Concept and the Genetic Improvement of Tree Crops (D.Dickmann, et al.). Application of DNA Markers for Identification and Breeding ofPerennial Fruit Crops (U. Lavi, et al.). Heterosis in Plant Breeding (C. Stuber). Breeding of Seed-Planted Artichoke (J. Basnizki & D.Zohary). Concepts and Methods for Analyzing Regional Trial Data for Cultivarand Location Selection (C. Lin & M. Binns).